Antique China Porcelain & Collectibles is a working site of Nacq Partners, Ltd., now located in Georgetown, Texas. We are successor to a business in Dallas, Texas named “The China Cupboard” Dating back to the late 1960’s, MayRee Bell and husband, Merton Bell began a journey that took them from their former careers–hers as a teacher, and his as an insurance executive. Together they developed a very successful business in antique porcelain and cut glass. 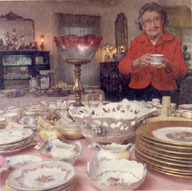 Mrs. Bell began by frequenting garage and estate sales, eventually focusing on dishes and glass. With her teaching background, she read voraciously from many volumes on antique china and crystal. Along with her husband, the 1970’s found the two dealing in china on weekends in an early version of an antique mall, in a converted church building on Maple Avenue in Dallas. In 1972, a group from California purchased their entire inventory. This allowed the Bells to retire from their “day jobs” and open a full-time shop. They leased storefronts in two areas near The Park Cities in Dallas until the late 1980’s, and then purchased a large older home adjacent to The Lakewood Shopping Village. They succeeded in getting the property zoned commercial, and operated The China Cupboard there until its close in July of 2002. A Dallas magazine wrote an article about the Lakewood era. 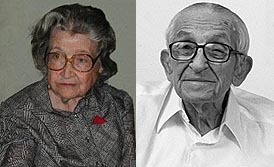 Mrs. Bell died in October of 2002, followed by the death of Mr. Bell in April of 2003. During their 35-year career in the china business, they had made many buying trips around the United States, and had developed a long list of repeat customers. In the second half of 2002, the next generation began working on the business. Lawrence R. (Larry) Bell, son of Merton and MayRee Bell, and his wife Anne moved the entire inventory of the shop (over 500 boxes plus furniture!) to Georgetown, Texas. Larry and Anne have since sold the entire shop’s merchandise, and this website has been retained for educational purposes.